South African photographer Sam Nzima, whose iconic photograph (below) from a Soweto uprising in 1976 helped turn world opinion against apartheid, died Saturday in Mpumalanga province, South Africa, according to press reports. He was 83. Nzima’s famous photograph showed a distraught 18-year-old named Mbuyisa Makhubo carrying the dead body of 13-year-old Hector Pieterson, a student who had died after South African police opened fire at a student demonstration. Police killed hundreds of protesters, and demonstrations spread across South Africa. South African authorities placed Nzima under house arrest for 19 months after publication of the photograph, which effectively ended his photojournalism career. But the impact of the photo was immutable: It brought the brutality of the apartheid regime to world attention. Eighteen years later, under growing international pressure and sustained protests at home, South Africa held its first free elections in 1994, and Nelson Mandela was elected president. Nzima was born on a farm in 1934, in South Africa’s northeastern region. He went to Johannesburg as a young man, working first as a gardener, then as a switchboard operator. A self-taught photographer, he landed his first job as a newspaper photographer at The World, a Johannesburg daily, in 1968. The World, which was a newspaper produced and read by blacks South Africans, was banned by the apartheid government in 1978. Other newspapers offered Nzima jobs afterwards, but he declined for fear of his life. Nzima fought for years for control of copyright to his iconic photograph, and finally won the rights to it in 1998. Johnny Miller offers compelling images of modern day inequality. Take a look. 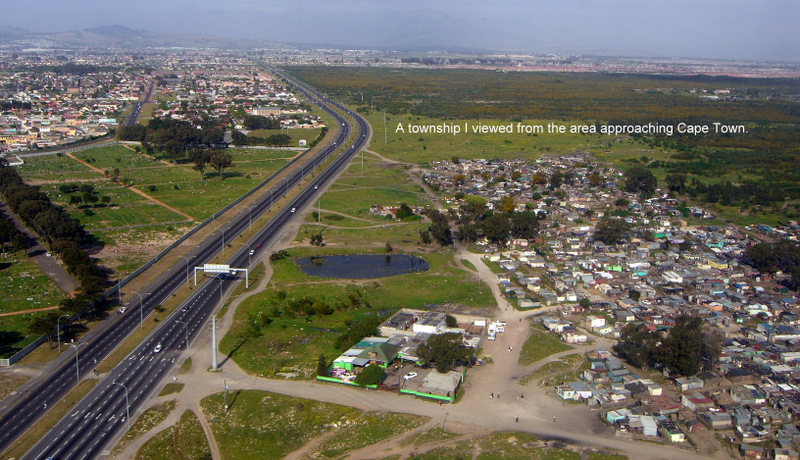 These images, shot from a drone, highlight the start realities of life in South Africa. And while you’re on his Unequal Scenes site, take a look at some of the other areas he’s studied. It’s difficult to sugarcoat this subject when looking at these from above. Amazing! And very unsettling! I hope to see more from this photographer. SAN FRANCISCO, CA–(Marketwire – Dec 5, 2011) – Filmed throughout the world over the course of more than 10 years, Have You Heard From Johannesburg is the definitive cinematic history of the worldwide effort to end South African apartheid. The five-part documentary series features astonishing archival footage and interviews with dozens of the major players in the movement, yet it belies the ordinary long-form documentary experience. Tension-filled, heartrending, and ultimately thrilling, Have You Heard From Johannesburg offers to a new generation the complete tour of an unprecedented global movement that forever changed a nation and the world. From acclaimed filmmaker Connie Field, this epic five-hour, five-film history will provide viewers with a detailed account of the anti-apartheid fight. But perhaps more importantly, it showcases the power of a global movement for justice, and reminds us all that the fate of even the most entrenched powers can be forever altered by committed men and women around the world. Have You Heard From Johannesburg will premiere on the Emmy® Award-winning PBS series Independent Lens, hosted by Mary Louise Parker, on Thursdays, January 12 and 19 from 9-11 PM, and Thursday, January 26, 2012 from 10 -11 PM (check local listings – It’s on PBS – KQED Plus Channel 28 on Comcast Jan. 16 and 23 at 10pm. for two hours. But it’s 8.5 hrs. and the other episodes haven’t posted. Times and channels differ). To learn more about the film and the issues it covers, listen to music from the movement, and explore an interactive timeline visit the companion website at www.pbs.org/independentlens/have-you-heard-from-johannesburg/. Connie Field (Producer/Director/Writer) has worked on numerous dramatic and documentary films as well as independently producing her own work. Her feature documentary Freedom on My Mind (1994) is a history of the civil rights movement in Mississippi. It was nominated for an Academy Award®, and won dozens of awards including the Grand Jury Prize for Best Documentary at the Sundance Film Festival. She was a director on Forever Activists (1990 Academy Award® nominee) and she produced, directed, and edited the feature documentary The Life and Times of Rosie the Riveter (1981). A look inside the townships of Alexandra and Soweto, South Africa. Understanding the history of apartheid in South Africa was a primary reason for my visit. I just couldn’t comprehend how a country with a white population of fewer than 10% could so dominate a black majority. Touring key struggle sites and speaking to both former political prisoners and pro-apartheid South Africans opened my eyes and heart. But the emotional impact remains. The South Africa of 2010, with a black majority rule since the first election in 1994, still struggles to overcome the decades of oppression. 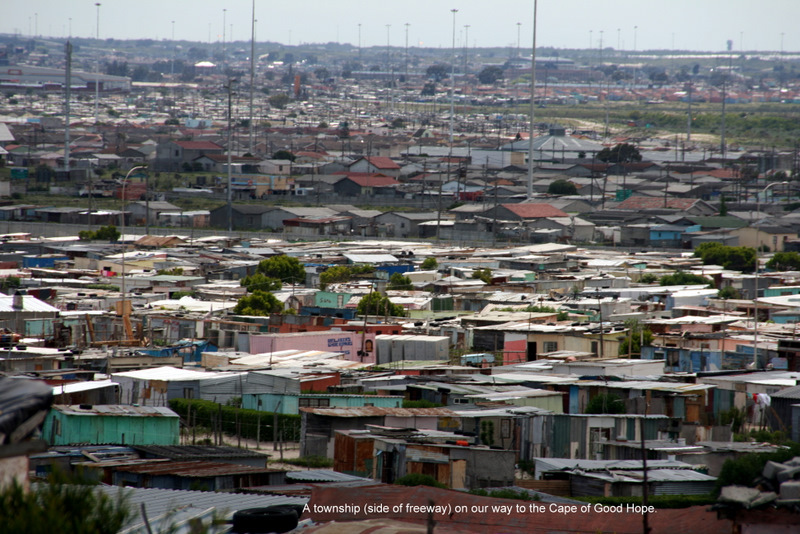 Almost 60% of the population lives below the poverty line; the townships formed by apartheid still exist. Soweto, an urban area of 44 townships, home to Nelson Mandela and Desmond Tutu, among others, is now enjoying a lower middle class resurgence. Alexandra, a township characterized by poor infrastructure, inadequate services, high crime and a severe environment, has the name of ‘Dark City.’ Yet, the people of both townships were present, engaging, spirited and walking the Streets of Hope. South Africa is only 17 years post election, and freedom and prosperity take time. With these photographs I hope to spotlight, and bring awareness to, an area of the world that needs our attention. 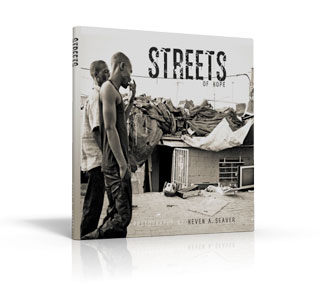 Streets of Hope, a photography exhibit, opens August 20, 2011 at the Marin Museum of Contemporary Art in Novato. Books will be available at the Museum. All profits from book and photo sales to Friends of Alexandra, an NGO serving the underprivileged and AIDS-orphaned children of Alexandra. I have reprinted this article in its entirety, adding some comments in italics. When Apartheid ended and the African National Congress under Nelson Mandela came into power in South Africa in 1994, the national holidays were changed to days that would be meaningful to all South Africans. South Africa is a very young republic in a history and baggage-laden body. I find it refreshing to see the holidays that were created (post election) with its new vision! On this day in 1960 the police killed 69 people at Sharpeville who were participating in a protest against the pass laws. Many were shot in the back. The carnage made world headlines. Four days later the government banned black political organizations, many leaders were arrested or went into exile. During the Apartheid era there were human rights abuses by all sides; Human Rights Day is but one step to ensure that the people of South Africa are aware of their human rights and to ensure that such abuses never again occur. Many countries around the world commemorate the contribution made by workers to society on May Day (America doesn’t celebrate this holiday because of its communist origins). It has traditionally been a day to protest for better wages and working conditions. Given the role that trade unions played in the fight for freedom, it is unsurprising that South Africa commemorates this day. On this day in 1956 some 20,000 women marched to the Union [government] Buildings in Pretoria to protest against a law requiring black women to carry passes. This day is celebrated as a reminder of the contribution made by women to society, the achievements that have been made for women’s rights, and to acknowledge the difficulties and prejudices many women still face. Nelson Mandela used the phrase “rainbow nation” to describe South Africa’s diverse cultures, customs, traditions, histories, and languages. This day is a celebration of that diversity. Afrikaners traditionally celebrated 16 December as the Day of the Vow, remembering the day in 1838 when a group of Voortrekkers defeated a Zulu army at the Battle of Blood River, while ANC activists commemorated it as the day in 1961 when the ANC started to arm its soldiers to overthrow Apartheid. In the new South Africa’s it’s a day of reconciliation, a day to focus on overcoming the conflicts of the past and building a new nation. This is the second printing of Julie Cason’s travelogue of our southern Africa trip. Check it out now! Copies will be available for sale at Seaver Photography Open Studio 2011 on May 6,7,8,14,15. More on that later. This is the official press release issued jointly by Google and the Nelson Mandela Foundation. A very exciting gift to the world! March 8th 2011, Johannesburg — Google has today announced a $1,25 million (ZAR 8,6 million rand) grant to the Nelson Mandela Centre of Memory, housed at the Nelson Mandela Foundation, that will help to preserve and give unprecedented digital access toousands of archival documents, photographs, and audio-visual materials about the life and times of Nelson Mandela. Based in Johannesburg, the Nelson Mandela Foundation Centre of Memory is committed to documenting records about the life of one of the world’s greatest statesmen. 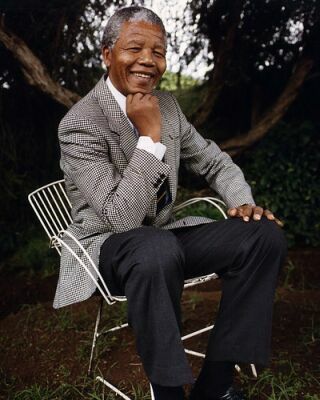 Its objective is to use his legacy to foster meaningful dialogue and debate to promote social justice. Google’s grant will assist in expanding the online Mandela archive and make it available to the global audiences, scholars and researchers in the future. In addition to significant audio-visual materials, the online multimedia archive will include Mr Mandela’s letters and correspondence with family, comrades and friends; prison diaries; and notes he made while leading the negotiations that led to the end of apartheid in South Africa. “We are delighted that Google has come on board to help ensure that our Mandela Portal becomes a world class source of accurate and reliable information about Madiba,” said Verne Harris, head of the Centre of Memory. A grant of the same size has also been made to the Desmond Tutu Peace Centre in Cape Town, for the documentation and digitisation of Desmond Tutu’s archives, and an interactive digital learning centre. Commenting on the initiative, Luke Mckend, Country Manager for Google South Africa said, “Google wants to help bring the world’s historical heritage online, and the Internet offers new ways to preserve and share this information. Our grants to the Nelson Mandela Centre and to the Desmond Tutu Peace Centre will facilitate new digital archives for South Africa’s past, giving the global public an unprecedented opportunity to engage with the history of some of the most extraordinary leaders of our time. We are also delighted to be announcing additional grants which will help many more people across South Africa and Africa access the internet and benefit from access to information”. Google today also announced three other grants of between $500,000 and $1,250,000, also made through the Google Inc. Charitable Giving Fund of Tides Foundation, to the Tertiary Education and Research Network of South Africa (TENET)($750,000 for continued work to assist South African universities with Internet and information technology services), the Nigeria ICT Forum ($500,000 to support efforts in improving access to Internet infrastructure in tertiary education institutions in Nigeria), and the Network Startup Resource Center (NSRC) at the University of Oregon ($1,250,000 to enable more people in numerous African countries to participate in and contribute to the global Internet). 	Images and press releases in English, Zulu and Afrikaans can be found on Google’s press site – please contact below. The Nelson Mandela Foundation, through the Centre of Memory, contributes to the making of a just society by promoting the values, vision and work of our Founder. The Centre of Memory offers an integrated information resource on the life and times of Nelson Mandela, giving members of the public, scholars and fellow memory institutions across the globe access to relevant information, primarily through the internet and mobile phones. It also prioritises dialogue around critical social issues such as access to information, dealing with the past, and related issues. Nelson Mandela International Day is the embodiment of these efforts, with its emphasis on remembering the past, stimulating dialogue and encouraging people to act (Memory, Dialogue and Action) in order to promote social justice. The Desmond Tutu Peace Centre aims to create and maintain a Peace Centre that will deliver programmes that promote conflict resolution, restore social justice to marginalised people and inspire leaders to be responsible and committed to the people they serve. It furthers the understanding that peace will flow out of justice and that there is essential good in everyone. TENET is a non-profit, public benefit organisation whose members are the public universities and statutory research and innovation councils of South Africa. TENET’s main purpose is to secure, for the benefit of these members and associated support institutions, Internet and information technology services, involving, inter-alia high- speed Internet access, inter-campus connectivity, ancillary operational functions in support of service delivery, and the provision of other value-added services as may be needed from time to time in support of higher education and research in South Africa. Founded in 2005 and owned by Nigerian Research and Education Institutions, the Nigeria ICT Forum facilitates and nurtures collaborations between Higher Education Institutions (HEIs). Its mission is to cultivate a favourable policy environment and enable Nigerian HEIs to develop, utilise and sustain ICT networks, services and shared resources consistent with institutional roles as foci for development. The Nigeria ICT Forum hosts the Nigerian Network Operators Group and the Bandwidth Consortium, and is incubating the formation of the National Research and Education Network (NREN) and a broadband strategy framework for Nigeria. The Network Startup Resource Center (NSRC) is a non-profit activity that has worked with many partner organizations over the past twenty years to help build Internet infrastructure and provide technical training in more than one hundred countries around the world, from Afghanistan to Zimbabwe. The NSRC works directly with the indigenous network engineers and operators who develop and maintain the Internet infrastructure in their respective countries and regions by providing technical information, engineering assistance, training, donations of networking books, equipment and other resources. The end goal in this work is to make it easier for local scientists, engineers, educators and students to collaborate via the Internet with their international colleagues by helping to connect communities of interest. By strategically working with universities, research institutes, Internet Service Providers, Regional Internet Registries, government agencies, supranational agencies, industry, private foundations and non-governmental organizations, the NSRC helps develop national and regional Internet infrastructure for collaborative research, education, and international partnerships. The NSRC is partially funded by grant awards from U.S. National Science Foundation’s Office of Cyberinfrastructure and Office of International Science and Engineering Directorates, plus additional contributions from numerous other public and private organizations. This is the first part of a list of films produced in South Africa or by the South African Film Industry (Wikipedia). NOTE: the first Free Election was held in 1994 and apartheid ended. The first film that I remember is The Gods Must Be Crazy from 1980. I saw Skin at the Mill Valley Film Festival in 2008 and was mesmerized by the laws and control of SA during apartheid. Part 2 will include documentaries and some other films. Many of these can be found on Netflix. The links take you to the movie description. ZED A: First Book Published! 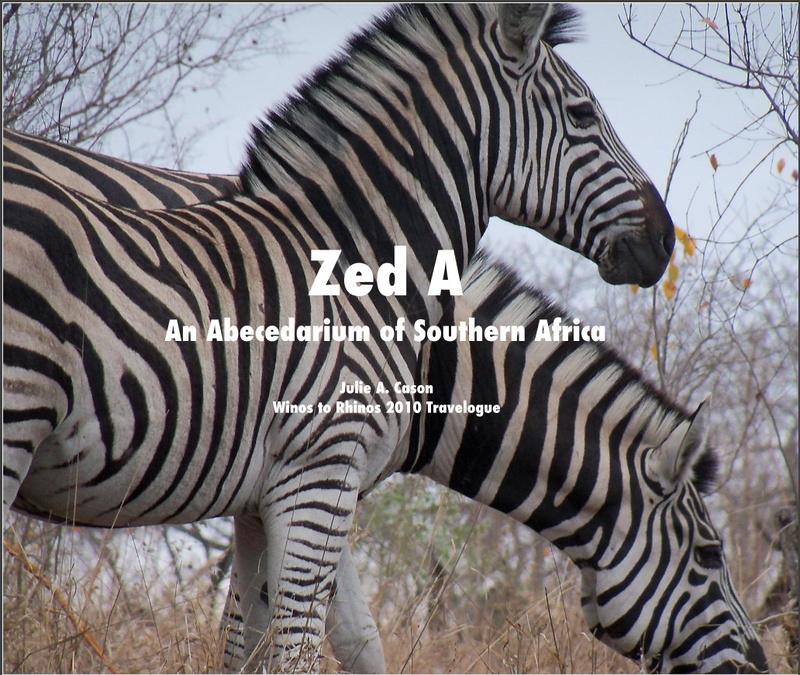 Zed A: An Abecedarium of Southern Africa was recently published by Julie Cason, who created, wrote and edited the first Winos to Rhinos ‘travelogue,’ a delightful view of our travels throughout southern Africa. As an ABC book, it reads as an intelligent adult’s book and a clever child’s book with a historical twist. Keven Seaver shot the bulk of the photographs but each member contributed images. This is what happens when you have a travel team consisting of a publisher, photographer, educator, researcher and business coach! Julie tells me this is the first of 3 books that she’s thinking about. The book is available for sale on blurb.com. We now have our photos available for your viewing pleasure. It was a difficult editing process, given that 4 of 5 of us carried cameras and 1 of 4 was a prolific shooter (me). So we have pared and edited and pared some more. Jan came up with “Jan’s Favorites”, a manageable number of our photos to get the overall feel of the trip. However, if you wish to really see and feel what we did, spend some time viewing our albums, based loosely on location or subject. Check our photos out at www.winostorhinos.shutterfly.com There is no membership required for viewing. But if you wish, you can join. And if you like this blog, don’t think it’ll end with the trip. There will be more coming, e.g. Lots of Boks about the antelope and deer of Africa, District 6: Then and Now, Ways to Help in Alexandra and Muchenje, and maybe others. We hope you enjoy our shots! We’d love to hear from you on our Shutterfly site or this blog. If you would like to share the blog or site with friends or on FB, feel free to do so. This has all been part of our journey! Lynn & I went to the District 6 Museum, a ton of history housed in an old church in the area referred to as District 6. The area was a vibrant, inner city residential area, home to about a tenth of Cape Town’s residents (60,000) in a mixed community of freed slaves, merchants, artisans, immigrants, and laborers. In 1966, under the Group Areas Act of 1950 (Acts of apartheid legislation) the area was designated a ‘white group area’ , demolished between 1968-82, and residents forcibly removed to the bleak, sandy Cape Flats about 25km away. So the District 6 Museum is filled with history, not only of a demolished community but also of the history that led to that. The floor map shows the area that was decimated, labeled with homes and features of the neighborhoods by its former residents; reconstructions of home interiors; and many faded photographs and recordings. This is a museum that had at least 5 groups of primary and high school students visiting when we were there. It has many lessons to learn, and in fact I did. The promising news is that after the second election (apartheid history is spoken as “before the election” (pre-1994) and “after the election” (post 1994 and Mandela)), President Thabo Mbeki returned the confiscated land to the former residents and in 2004 keys to new houses were given to two former residents. There are plans to build another 2000 homes but, partly due to a lack of funds, most of the land remains vacant. The talk is now of building a commemorative park and memorial to the people of District 6. The concept of township, ‘tribal homeland’, or ‘location’ was conceived under the Group Areas Act of 1948. It outlawed whites and blacks living in the same place. The townships became a dumping ground for people not classified as white, as well as a source for cheap labor. The government’s apartheid architect used a grid layout, with a single point for entry and exit, as a means of control. They were set many kilometers out of the city or town center, designed as temporary, and constructed with no provision for electricity, water or sewage. (Soweto, short for South Western Township and the world symbol of all townships, got electricity in 1988) The areas where black and mixed people (they still use the word ‘coloured’ to describe mixed races) once lived were decimated and declared White Group Areas so that the whites could move closer into the city and jobs. The townships are still there. They are quite visible. 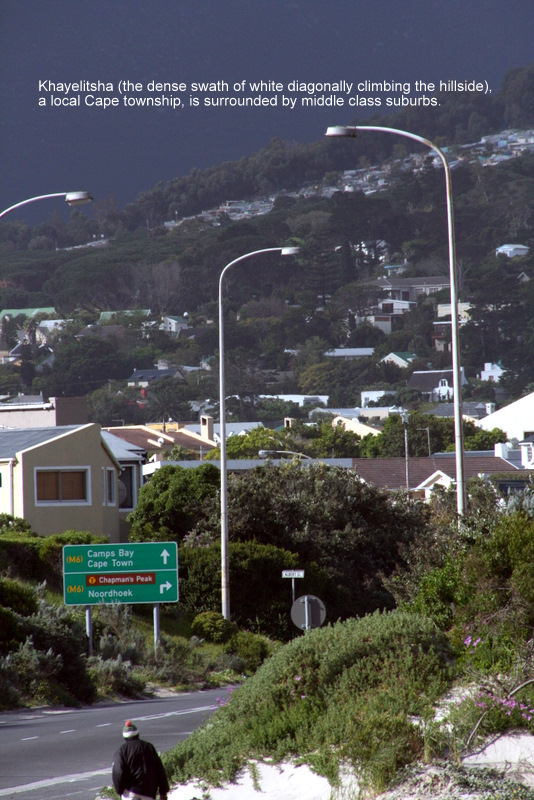 We drove around the Cape and passed several that were set near middle class suburbs (Khayelitsha) , beaches, freeways, etc. Later in our trip, we visit Alexandra and Soweto in the northern Gauteng province near Johannesburg. South Africa isn’t the only country with segregation laws. Think about our Jim Crow Laws that were in force until the Civil Rights Bill of 1964. But South Africa is the one that taught me the lesson. It will remain in my mind forever. Victoria Falls is a very small town; blink and you miss the main drag. However, it is home to one of the Seven Wonders of the World…Victoria Falls. We are now in Zimbabwe, a country in trouble…they have no currency of their own and are operating on US dollars, Euro and SA Rand. 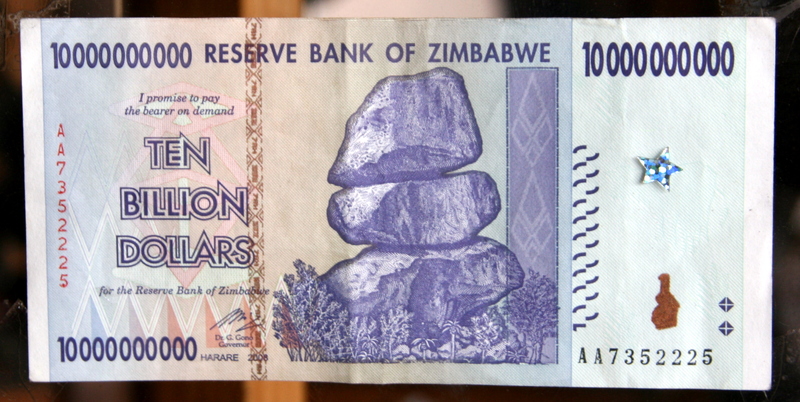 You can buy a three trillion-dollar bill from the street hawkers as a souvenir. Yes, you read that right. The Victoria Falls Hotel is one of the grand Royal Hotels. The walls are lined with British Royal photos commemorating royal visits. There are old photos of the early stages of the hotels development. The Stanley Bar honors Mr. Stanley from the New York Times who found Dr. Livingstone. We have drinks on the terrace while looking over the vast grounds and out to the gorge, spanned by the Victoria Falls Bridge – designed by the same engineer (Sir Ralph Freeman) who designed the Sydney Harbor Bridge. (bungee jumping anyone?) In the distance – the spray of the falls tops the trees. Our rooms are nice, a claw foot tub, lots of the “hotel” chrome. This is where the recent décor trend was inspired. Now they should go to Restoration Hardware cuz it could use a bit of an upgrade – it’s showing its age. 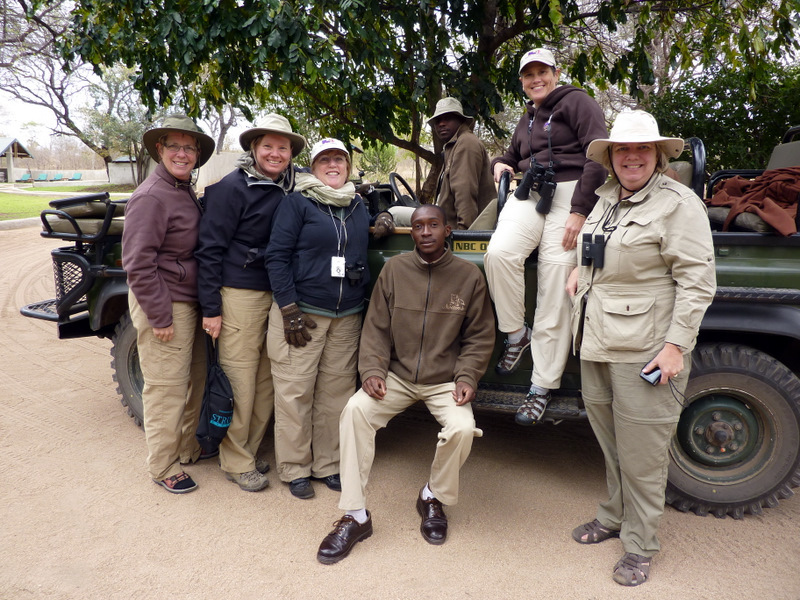 We are picked up by Paka, our guide, and Victor, our driver, – off for a “Sundowner Cruise” on the Zambezi River. We have the boat to ourselves and relax with a drink and a front row seat to the hippo show – 6 of them! We see crocodiles, warthogs, baboons, numerous birds, and a water monitor. It’s sort of like an iguana, croc, lizard combination. It marches around the shore like it’s on patrol, thus the name. The sunset is stunningly gorgeous, made bright red by smoke from nearby fires. We go to bed to the sound of the “Psycho” frog outside in the garden below…eeek, eeek, eeek! In the morning we are all excited…off on adventures. Keven and Lynn took a helicopter ride over the falls and greater area. Julie, Lisa and I went on an elephant ride! Oh what a thrill! I’m ecstatic. I climb a high platform and throw my left leg over a saddle with a back support, grab onto a bar in front of me and DON’T LET GO! I have a guide riding in front of me who expertly leads my elephant, Doji, on a walk through the bush. We see a herd of African Cape Buffalo. (Add it to the list). We ford a river and plow through the brush. The “ellies” eat the whole way, ripping up grass and tree branches. When we disembark, the elephants line up so we can reward and thank them. With a huge handful of pellets it’s OPEN WIDE and into their mouths goes their treat. It’s their favorite part of the experience. So now I’ve closed the parenthesis started 25 years ago on the ride in Milwaukee. Riding Doji was a thrilling and satisfying completion to this dream trip. Doji means “to be found”; he was an orphan left by an old bull and too young to fend for himself. He is now 9 years old. The elephants are trained to carry people, but still roam freely throughout the day. We had a baby along on the walk – who howled for milk before we took off, she got what she wanted. The preserve is a refuge for injured or orphaned elephants, often caused by poaching. We make a contribution to the cause by purchasing a documented footprint of our elephants; how about that for a cool souvenir? Ah…an afternoon relaxing at the pool…it’s so nice to have the down time. Tonight we attend a “boma” dinner. It’s like an Hawaiian luau on steroids…the old Trader Vic’s gone wild. We enter the restaurant and are greeted with a smile and a piece of fabric tied around us. Oh boy, costumes. It’s hotter than sin and they want us to wear another layer?? There is a big fire in the center of the room, a whole lamb splayed out on a vertical frame for bbq, lots of smoke! Great… Keven has asthma… this should be good. There is a huge buffet of salads, desserts and the chance to taste elaborate African meats: steak, eland terrine (yummy!) warthog (great! ), and impala (sadly overcooked). 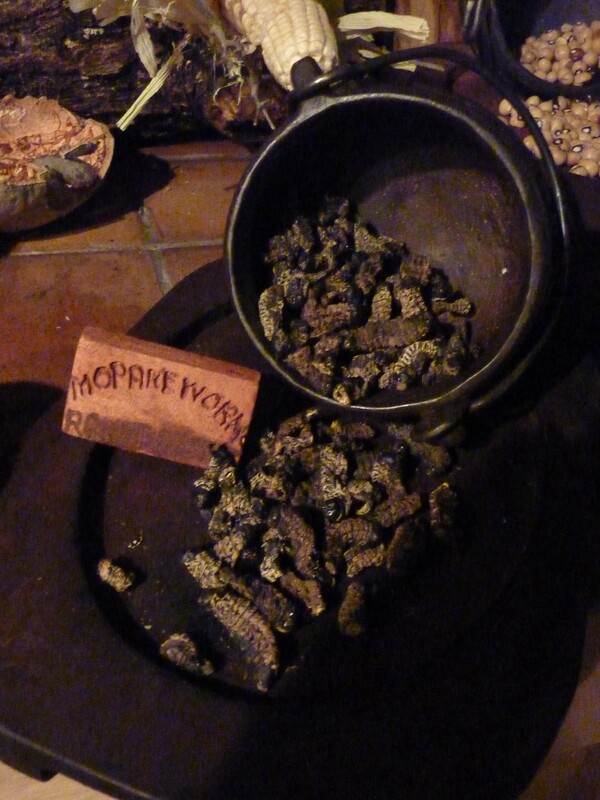 The kicker of the night is the Mopane Worm, crispy-cooked larvae, if you eat it in front of the chef, you will get a certificate of authenticity. Just pick it up and eat it! There are five such certificates now in our possession! We finish our total tourist experience with Zulu dancing and audience participation drumming and dancing. Yours truly got out on the dance floor as the social ambassador for the group. The end…of the only contrived tourist event of the trip. The next day is completely different. We walk to Victoria Falls. Late afternoon heat is relieved by the spray from spectacular waterfalls, adorned with rainbows and double rainbows. The meandering walkway winds from Kodak moment to Kodak moment, through lush rainforest and along the steep ravine. Paka says to really experience Victoria Falls one should see it twice; once in the high season when all the walls are covered with falls and the spray is so thick you can hardly see, and once in the low season lower water, much better visibility. It’s the low season right now. One stop we are drenched, by the next we are dry. On this very hot day this is the perfect place to be – a real wonder. A stark reality indeed. I’m sitting on my little deck watching ants, mongoose, flies, birds and butterflies. When I look out I can hardly imagine how life really survives here. It’s hot, dry, and stark looking. 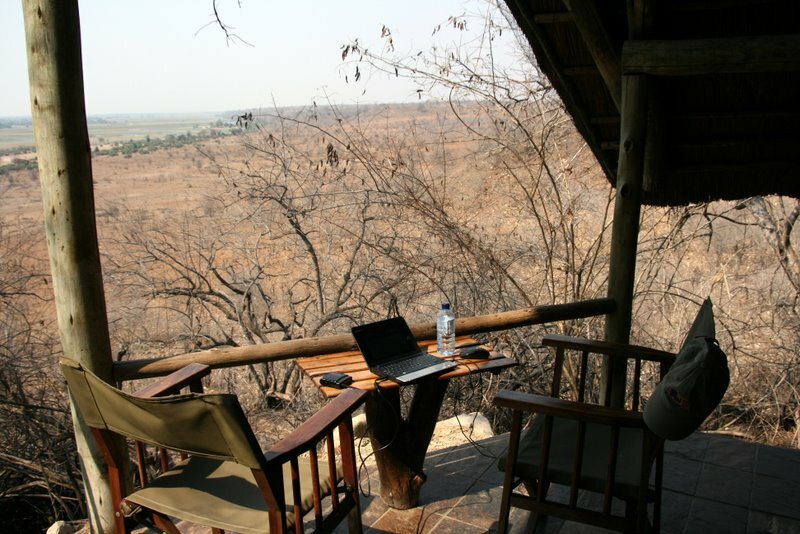 (OK to be fair, there is also the Chobe River and green tidelands but they are on the other side in Namibia – the grass is greener on the other side is true indeed!) The trees look dead. (Lynn reminds me that Buffalo looks like this in winter too) The ground is sandy and dry. It’s been a dry winter for them and an apparently short spring, so I wonder what keeps animals and people alive. After 6 game drives over the past week, I decided to stay home. The 100+ heat was leading me to heat stroke and today would be a big outing. The Winos to Rhinos ( minus me) are on a full day game drive and river float where they will probably see hundreds of animals. Instead I chose to go to visit a local village and elementary school with a delightful British couple and our guide, Chipo (a rare female guide amongst a world of men). We were able to choose a home to visit (we didn’t know this and finally she told us to choose one), so we chose a rather nice one with cows. Turns out the homestead is home to an extended family – grandmother, aunt, and couple with their daughter and grandson . We spoke to the daughter, a young woman with an adorable 2 year old son. She seemed to be about 24. Tomorrow she will leave for business school about 6 hours away for 3 months, leaving her son with her mother. We met her older sister, married, living with husband and 3 daughters – 22, 17,14, the oldest finishing her last year at university. Her sister lives about 10 miles away. The two sisters drove off in a new SUV, possibly heading to town for groceries. This was an extremely affluent family, indeed! While we didn’t go inside the house, we could tell that it was newer and well constructed. The TV was on, so good indicator that they had power. They had a propane- run refrigerator (outdoors – like ours at the moment LOL)) with an enclosed outdoor kitchen (unlike ours). There were cows, chickens, two vegetable gardens, many buildings. We have no direct comparison but we know this is a family with means. We drove by the other houses in the community and they usually were tin and brick shacks. Next we visited the elementary school. We met the principal (a woman), and the deputy principal (a man) and passed inspection. We then visited a class of kids maybe 20 of them, mostly boys about age 6. They all wear uniforms learn both the native language and English, and interesting to me, all had shaved heads. Apparently it avoids arguments about hair brushing in the morning! They Loved Watching Themselves on Video! 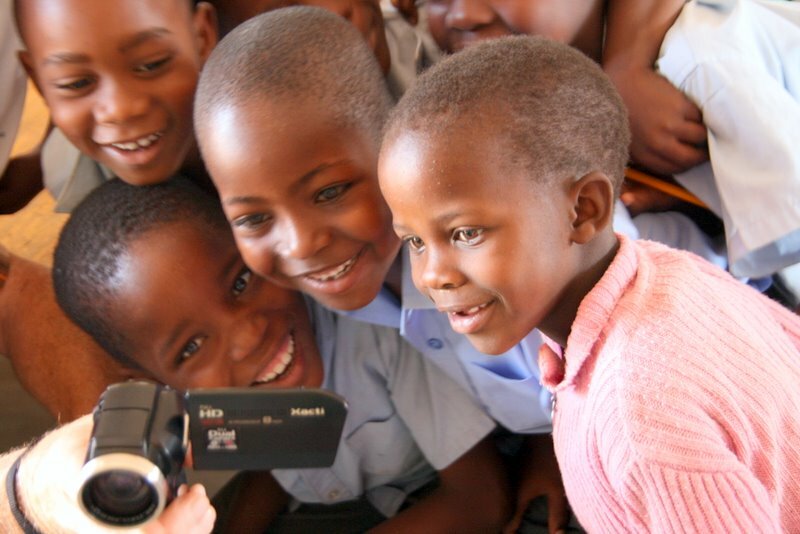 While I photographed the children, Paul videotaped them and showed them on the spot. They loved it! They sang a few songs for us in both languages and one stellar student recited the alphabet in English. This age likes to perform! We thanked the teacher for allowing the spontaneous disruption of her class. On our way out we ran again into the principal and began, with our guide, a look into the monarchy, governmental rule of the UK, and their money system. Then we turned to the US with a question about our economic downturn. At once I became the economic advisor and authority on the financial crisis, Obama, and Arnold Schwarzenegger. Boy did they pick the wrong person, but I winged it with a simplified explanation and passed the test! I needed this day off. From my perch here, I see, in the very far distance, zebra, elephants and numerous types of boks – springbok, impala, steenbok, etc. If I sit here long enough, I will see the girls return through the vast stark landscape. Tonight’s happy hour will be a great show and tell as I learn about their discoveries today. Tomorrow we head to Johannesburg for a final two nights and two full tour days of apartheid and struggle history. Now that’s my type of day! Get updates on Winos to Rhinos Now! Enter your email address to subscribe to our Winos to Rhinos blog & receive notifications of new posts by email. What topic do you want to read? Lions and Ellies and Rhinos, Oh My! Corlu, This One’s for You!